At Armed Sports® Performance we are dedicated in making a difference in every athlete’s life, through athletic training programs that we design to help him/her achieve his/her goals. By offering our youth athletes a comprehensive series of evaluations, testing, training and sports development opportunities, our athletes are exposed to the latest concepts in sports training. Armed Sports® Performance will work closely with each athlete adapting a specialized program to develop core stability, speed improvement, running form, agility, acceleration, strength training and injury prevention techniques. Our goal is to have our athletes bodies and athletic performance ARMED for competition. "Playing 7 years in the NFL, for three different teams, I have picked up techniques and learned from some of the best trainers in the world. All of the Armed Sports® Performance trainers have been trained to the highest caliber and have been taught to take an athlete to the next level, no matter the sport. 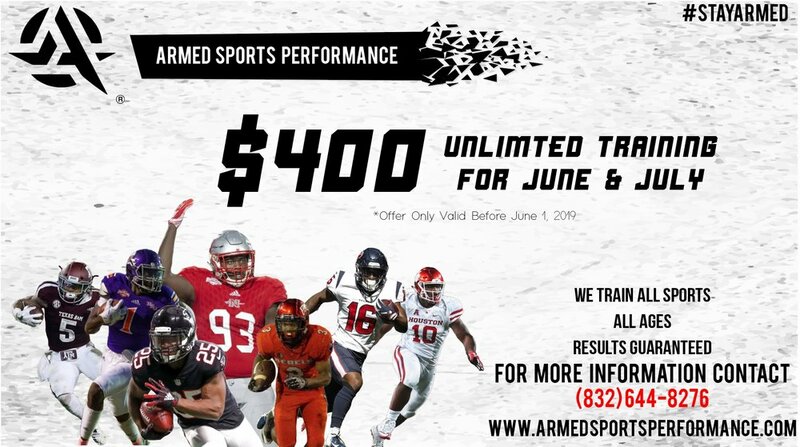 We at Armed Sports® Performance require all of our trainers to have Professional or College playing experience to guarantee that our clients are learning from trainers who know what it takes to succeed in sport. Our specific protocols and programs cater to all athletes. We are proud to say that we can take any athlete, at any age, from any sport, and train them to excel in their competition." Go checkout the Armed Sports® Apparel line. Currently only carrying Mens, with Women and Kids lines coming soon!